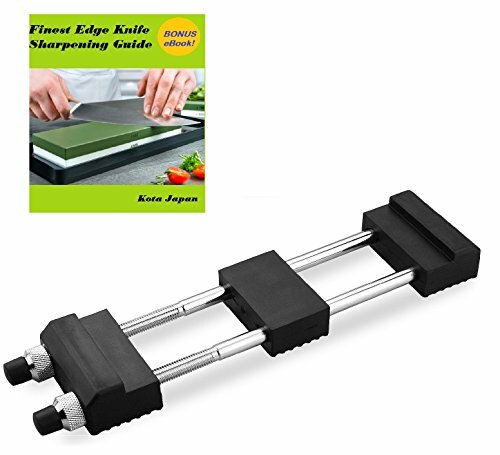 FULLY ADJUSTABLE - Fits sharpening plates and whet stones from 5-1/2 inches wide to 9 Inches long. This prevents any sliding of the device or the stones during the honing process, ensuring worker safety and exceptionally keen blades. VERSATILE - Works perfect with diamond and oil stones for cutlery as well as a variety of tools and chisels. It's the perfect holder for use with diamonds and oilstones. QUALITY - Durable chrome-plated arms resist corrosion, providing you with a long-lasting kitchen tool. UNCONDITIONAL LIFETIME WARRANTY | 100% TESTED | BUY WITH CONFIDENCE!! Visit KotaJapan or call our friendly US BASED Customer Service in Sunny Arizona: 602-396-2800. UNCONDITIONAL LIFETIME WARRANTY! - Highest Quality Workmanship, 100% Inspection Tested. Visit KotaJapan or call our Friendly Customer Service in Sunny Arizona: 602-396-2800. View More In Knife Sharpeners. If you have any questions about this product by Diamond Sharp, contact us by completing and submitting the form below. If you are looking for a specif part number, please include it with your message. Kuma Kitchen Knife Sharpener - USER FRIENDLY - 8 Inch Steel Honing Rod for Sharpening your Chef's Knife, Carving Knife, Chopping Knives, And More! - Easily Hone & Recover Your Sharp Edge Today!